Fall is officially upon us, and so is the competition season beginning on October 5th, 2018 in Wellington. The hunter/jumper competitors are back in full force with the Green Conformation and Performance Hunters leading off the fall season in the Wellington Equestrian Realty Arena in the Equestrian Village. The series will begin with ESP October (October 5-7) featuring USEF “A” National Hunter Competition and USEF Level 3 jumper opportunities that will take place at the Equestrian Village at Palm Beach International Equestrian Center (13500 South Shore Blvd, Wellington, FL). The 2018 ESP Fall Series will feature a $10,000 1.40m Welcome Stake, as well as M&S and NAL Classics. Pony, Child, and Adult Classics will also be offered each week. After ESP October, competition will move to the main show grounds at Palm Beach International Equestrian Center (3400 Equestrian Club Dr, Wellington, FL) and remain there through April 2019. ESP Fall I (October 12-14) and ESP Fall II (October 19-21) will offer USEF “A” National hunter classes and USEF Level 3 jumper competition. The official 2018 ESP Fall Series Prize List is now available for viewing at www.pbiec.com. 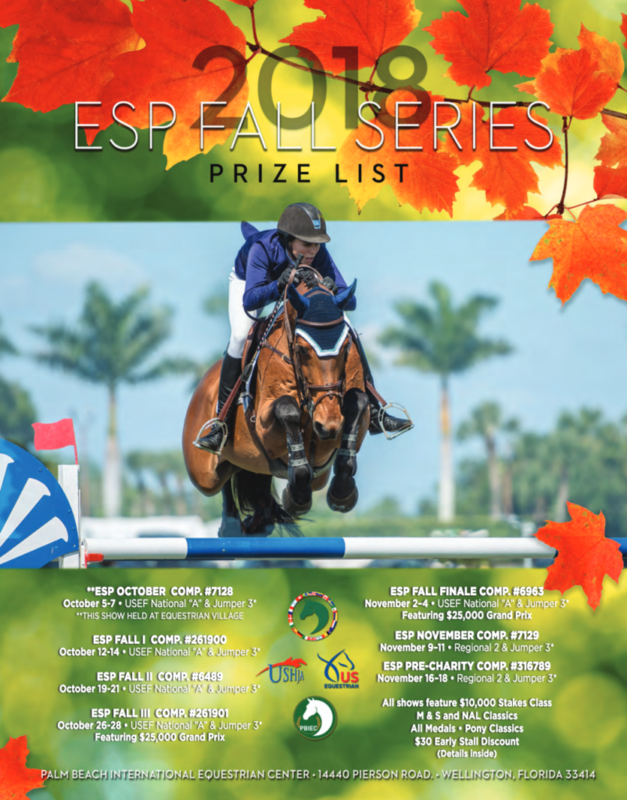 The ESP Fall Series, which will begin on Friday, October 5, and continue through the fall months, is set to conclude on Sunday, November 18, 2018, at Palm Beach International Equestrian Center in Wellington, FL. Click HERE to view the ESP Fall Series Prize List! We hope you will join us for the main attraction of the competition season, the Winter Equestrian Festival (WEF), which runs from January 9th through March 31st, 2019 at the Equestrian Village. Stay tuned for more seasonal updates in the near future! Browse Wellington's Best Horse Farms Here.